I imagine everyone else has it more together than me. That they can accomplish things easier with less uncertainty. That they don't struggle with fear of failure or lack of confidence. I know, this has come up frequently. As I grow in the roll of mother I've realized that, of course, those busy mothers are not having an easy time all the time. The women I looked up to as Super Heroes or Martha Stewarts were actually average human beings just like me. Maybe they had a head start in the area of grappling with life, thanks to roll models or necessity, but they all have their struggles too. They do things with apprehension. They wonder about their choices. They have exhausted, brain-dead moments. They get mad. They have to let things go. They have to wing it and learn while doing. They make mistakes. And they have times they don't think they can. I've come to realize that many things that appear formidable, that give me a feeling of being incapacitated, are actually not all that hard. They just require my time. With such a selfish, lazy, insecure past (and don't tell me that's not true, because it is), that can be difficult to follow through. I struggle finishing a single chore without getting distracted, let alone accomplish a whole day-consuming task. But, necessity, along with wanting more, breeds growth. It starts with begrudgingly cleaning poop out of the tub at the end of an exhausting, long day. Scrubbing the food-fight look of the dining room when I wish she would just not throw. Washing the floors again and again and again. As I get more proficient in doing these things when I don't want to, I grow in my ability to choose to do a more involved task. Maybe I'll choose to follow through laundry to completion one day. I know this is an obvious weakness when my husband can't find pants for the toddler because he wouldn't think to look in the drawer instead of just the basket. The other day I did accomplish a feat. For me, at least. Thanksgiving, my husband bought a turkey. The day before our thanksgiving feast, we decided to invite people and it suddenly turned into dinner for eight (ten, but two didn't show). Usually my husband would help, with frozen appies, stove-top stuffing, packaged gravy, and a store bought dessert (and many Italian influenced comments to make more, more, more). I was determined to serve a dinner that didn't have the processed and the high salt. So I took the whole day alone to cook and occupy our toddler. I discovered, like I said, that it wasn't impossible. Just time consuming. Especially with the moments I would say, "Just a minute, sweetie, I'll come look/ play/ cuddle/ read as soon as I get this in the oven/ finish mopping this floor". I got the turkey in the oven. I made pie. I prepared potatoes and chopped up a salad. I made sausage apple stuffing. I whipped up cheese sauce for broccoli and cauliflower. I baked brown sugar squash. And, worried the whole time that it wouldn't work, I made gravy. After dinner I made whipped cream. It wasn't perfect. The stuffing was soggy. The cheese sauce runny. The gravy was thin. But it was good. And, of course, while I cooked for guests, I scrubbed bathrooms, cleaned floors, washed dishes. And cleaned up at the end of the night (we have a tall, bad dog who requires a clean dining room and kitchen or he will try to help, and chew up dishes in the process). There were other things I couldn't do that day. But the reward was worth it. A day was totally eaten up beginning to end. But as a result we had a nice dinner, with great company to talk with and cute entertainment from my little flirty singer. I love having people over for dinner. I wish I could get myself over my issues of busyness mixed with laziness and anxiety that results in not being hospitable. A while ago, my husband and I decided we would have a dinner party once a month. That maybe happened once. But, it is still always in the back of my mind. I think the biggest thing is to change my focus. Concentrate on the results. Enjoy the learning. Live in the moment. Not in fear of failure. Fear of people cancelling. Fear of people being uncomfortable (because seriously, I've never found an acceptable temperature). Fear of being judged. Fear of ending up ready too early or late. Fear of forgetting something important (I still vividly remember my mom crying once when I was a child because she made a big turkey dinner and forgot a major component). Instead, I just need to enjoy the now. My toddler is helping me take advantage of each opportunity. To stop and smell the roses (though I think she still blows instead of sniffs). She impels me to see the new and exciting in everything. 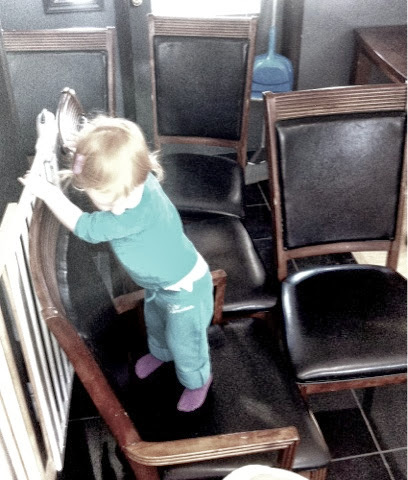 She had a blast climbing the clumped chairs while I mopped. She loves to taste test and stir as I cook. She loves to go through the utensil drawer and identify everything she finds. She'll pull out a ladle and declare, "Soup!" Or pick up something else and say, "What's this?" Then repeat my response over and over. She loves the kitchen. And she loves company. My husband loves company, too. Another reason to push through what makes me uncomfortable so we can indulge in what we love to do together. So, who's coming for dinner next?